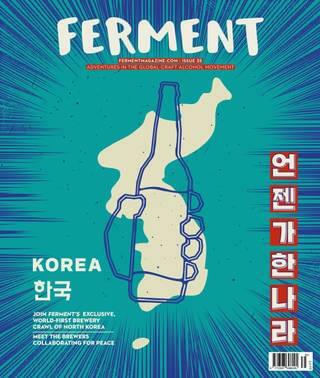 Korea may be making great headway on the craft beer front, but it’s in spirits that the nation is truly smashing it. We may not see much of it in the UK, but traditional Korean Soju is the best-selling category of spirit in the world. Compared to other spirits, the definition of Soju is – to say the very least – loose. Dating back to the 13th Century, Soju sprang out of distilling knowledge introduced during the Mongol invasions of the Korean peninsula. The word Soju means ‘burned liquor’ and refers to the practice of boiling traditional Korean rice wine in a kind of cauldron topped with a soju gori distillation hood, to drive off the alcohol and create a clear spirit. This relatively small-scale craft was thrown up in the air during the mid-1960s, when a shortage of rice for food prompted the South Korean government to ban the traditional method of distillation. The entire industry switched to using concentrated commercial alcohol – made primarily from high-yield sources including sweet potato and tapioca – which was then watered down and mixed with flavourings and sweeteners such as saccharin and stevia. The prohibition of rice distillation was lifted 25 years later, but the traditional industry did not bounce back, and most South Korean soju is still made using industrially-produced ethanol from a single supplier. In tandem with this, the alcohol content has steadily dropped as some manufacturers have increased their dilution ratio, resulting in a range of strengths from around 16% to a more spirit-like 53%. The end of the rice ban also coincided with the explosion of soju onto the international market, particularly in the far east. Jinro soju has been the world’s biggest-selling spirit brand by volume for over a decade, outpacing its nearest rival – the Thai spirit Ruang Khao – two-fold, and shifting three times as much as Smirnoff. The traditional approach has not died out completely though, and several parts of the country have seen a resurgence in distilling from rice, creating a new category of highly-regarded premium Soju. These brands are beginning to pop up in the UK, so look out for Chamisul, Chum-Churum (surely Mary Poppins’ tipple of choice) and the much-treasured Andong. Unlike cheaper soju, which are really only good as the base of equally cheap cocktails, these traditional spirits can be enjoyed neat, pair well with food, and are quite subtly flavoured; sweet and grainy, with a soft, buttery mouthfeel. As beer lovers, we should be particularly interested in the art of ‘somac’: basically, mixing beer and soju (or ‘manufacturing’ as the locals call it) in different ratios. So popular is this practice that many Korean beer glasses come with measurements printed up the side, so drinkers can indulge in their own bar-top manufacturing. Mixing technique is a matter of personal taste, though many connoisseurs go for an extravagant swirling vortex, which inevitably results in spilled booze and attendant hilarity. Nobody wants to look like they’ve just stepped off the boat when drinking in another country, and Korea has some pretty firmly-held views when it comes to drinking etiquette. Many of these traditions date back at least 700 years, and their teaching from one generation to the next remains a treasured rite of passage. Of course, quite how rigorously they will be enforced in a hip Seoul craft bar is questionable, but there’s definitely no harm in letting people see you know what you’re doing, especially in a country that has among the highest per-capita alcohol consumption in the world. Here’s our basic guide to not causing a major diplomatic incident. Don’t drink alone. It’s a group activity. It’s considered bad form to fill your own glass. Finish your drink and someone will refill it pretty swiftly. When your glass is being filled, hold it with both hands. If you see someone’s glass is empty, offer to refill it. Again, it’s best to hold the bottle with both hands. Age and status are a big deal. If you’re drinking with someone older or of a clearly higher status, it’s polite to turn away from them as you drink (some sticklers will even cover their mouth with a hand). Top tip: If you’ve had enough, simply don’t finish your drink. Nobody will top up an unfinished glass.